For some reason my 1960’s set of Blast Off never got beyond take off. Maybe this was due to it’s production was based on the fact that the sixties was the decade of the space race. Only a few years earlier Neil Armstrong first walked on the moon and therefore game-play (which i thought was the Waddington trademark) was left behind. It’s true the Blast Off game for 1 to 4 players captures the atmosphere of space travel, but no one ever wanted to play it with me as a kid. I even tried it as a one player game but it just made no sense. The overview suggested You Blast off from Earth and visit all the planets on a small supply of fuel. Rise up to the correct orbit and then move around the board and try to make a landing on the next planet. Complete all nine planets, visiting the moon after each, and return to Earth. There was also the added idea that your space ship would try and land on the other players’ spaceships to force them back to Earth. 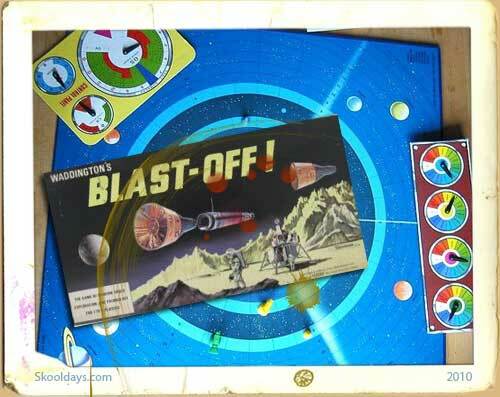 The game consisted of a Space Game board consisting of orbiting planets 4 coloured Space Capsules and 4 Satellites. 4 Control Panels that looked remarkably like the dashboards used on Waddingtons Formula one Board game that was awesome.A Master Control Panel, a Moon playing piece and 10 Thruster Rocket Cards. In the end i gave up and went back to the good old favorite Waddingtons games, but there is always a feeling of maybe it was a great game and i just never got it. Anyone out there ever play Blast Off? This entry was posted in Pop Culture, Toys by Skooldays. Bookmark the permalink.